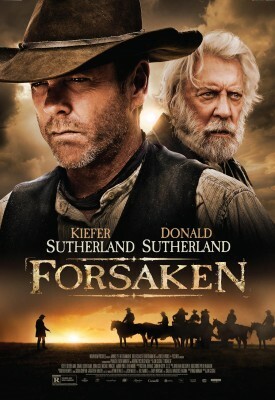 Forsaken is a classic tale of a lone ranger returning home that does little to excite between the opening scene and him riding off into the sunset – literally. The movie is set in an era of American history that has been chewed over quite a bit in traditional Western cinema: the construction of the railroad. It gives us the exciting struggle of the greedy businessman versus the humble homesteader, and unfortunately is completely predictable. With beautiful cinematography, the film really brings it home with landscape shots and traditional cowboy/western scenes. But where the film really lacks is in the story telling. Kiefer Sutherland, playing John Henry Clayton and his father Donald Sutherland, playing Reverend Clayton had the potential to really bring an exciting performance to the screen. It was captivating to watch the father and son act side by side, and at times it brought more life to the scene. Brian Cox playing James McCurdy, the despicable businessman who is forcing families to sell to the railroad, is a good choice for an antagonist but has an awkward script at parts. He is the only character who swears repeatedly in the movie and it just doesn’t fit. Even Demi Moore was an amazing choice for female lead, but what lacked in all these characters was a good narrative to fit into. Not far along into the film it’s obvious you’ve learned almost everything you need to know about the characters in the first few scenes. Lone ranger John Henry is a war torn man who’s just returned home after who knows how long only to find his mother dead and his hometown in a struggle against the railway. His father is disappointed and alludes to John Henry’s past as a gun-slinging murderer who doesn’t have the ability to change. Demi Moore, John Henry’s past love, is married off and creates the necessary heartbreak needed for the lone ranger story to be complete. It’s a slow buildup to the excitement but eventually the movie does pick up and there is sufficient action to keep you entertained and recoup some of the time you’ve lost. Despite his resolve, the gun-slinging past of John Henry eventually creeps back after he’s pushed to his limits and, in true western style, the antagonists are finished off in one final saloon shootout and the hero rides off into the sunset. The best of this film was the cinematography, a few decent shootouts, and the potential for a good performance from Donald and Kiefer Sutherland. All in all, I would probably suggest this movie for a Netflix and chill night, as it doesn’t matter too much if you miss a little here and there.